The Charleston Jazz Initiative (CJI), a project of the College of Charleston’s (C of C) School of the Arts, Arts Management Program, in partnership with the Jazz Studies Program, Department of Music, Avery Research Center for African American History and Culture, and other sponsors, announce a series of events, August 27-29, 2015 to kick off the national book tour of author Alfred Green, the son of Charleston native and renowned rhythm guitarist, Freddie Green. All events are free (donations are suggested), open to the public, and are held at various locations at the College of Charleston. For more information, call (843) 953-5474 or (843) 953-6301 or email Dr. Karen Chandler at chandlerk@cofc.edu. See this article in Charleston’s Post and Courier from August 23, 2015 by Adam Parker, Arts Editor. Rhythm Is My Beat chronicles Freddie Green’s life (1911-1987) and jazz career from his days growing up in Charleston, his music studies in the 1920s at the Jenkins Orphanage where he toured with the orphanage band as a vocalist and learned upholstery as a trade, to his nearly 50-year career as a legendary rhythm guitarist with the Count Basie Orchestra from 1937-1987. By Basie’s own account, Green was the pulse of the band, and along with Basie, Jo Jones, and Walter Page, he set the band’s pace and helped to define American swing. Together, they were arguably the definitive swinging rhythm section of the big band era. Green, who was hired by Basie and was the longest serving member of the band, is universally acknowledged as the greatest rhythm guitarist in jazz history. Referred to as Mr. Rhythm, Freddie Green’s guitar technique was so unprecedented and innovative that it is often characterized as an art form. Drummer Louie Bellson in Alyn Shipton’s A New History of Jazz, describes Green’s unique technique this way: “Freddie Green…was one of the greatest rhythm players I ever heard in my life…he had a certain stroke with the right hand, that really was a great marriage to the right hand of a drummer, to the right hand of a bass player, and the right hand of a pianist. It was something that you had to watch.” From his early gigs at the Black Cat Club in Greenwich Village to his work with drummer and bebop rhythmic innovator Kenny Clarke, the development of jazz was enriched when impresario John Hammond recommended Green to Basie as a replacement for Claude Williams. Prof. Tyler Ross opens up to the public his jazz repertory class with guitar and other jazz students to hear Michael Pettersen discuss Green’s guitar technique. Pettersen’s work on Green is documented at www.freddiegreen.org. 20 Franklin Street in Charleston, the original home of the Jenkins Orphanage, is the inspiration behind this ensemble and its music. The band will play compositions by Freddie Green as well as other music that is associated with or influenced by Green and the Count Basie Orchestra. The events are sponsored by the Arts Management Program and Jazz Studies Program/Department of Music in the School of the Arts, Avery Research Center, and Barnes & Noble/College of Charleston Bookstore at the College of Charleston; BME, LLC, Bell Digital Media, Jazz Artists of Charleston, Jenkins Institute for Children, and the Charleston Jazz Club; and funded by the Charleston Scientific and Cultural Education Fund. 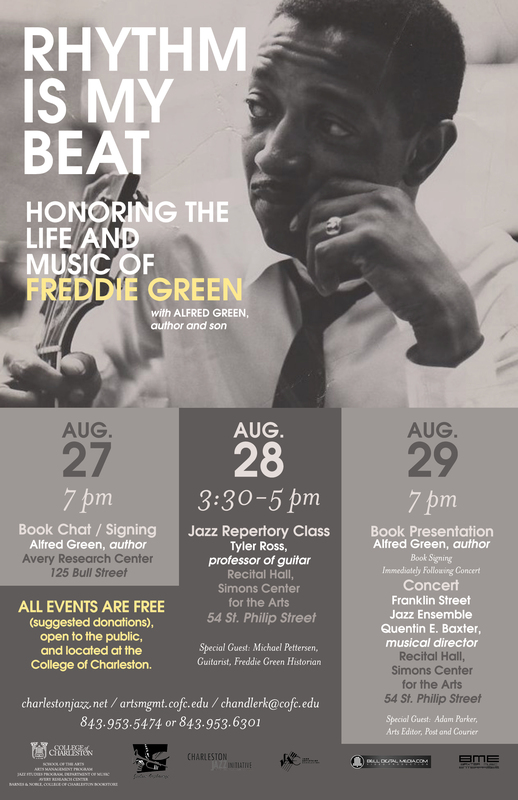 For information on Freddie Green and Rhythm Is My Beat, see www.freddiegreen.org and www.freddiegreenrhythm.com. For more information on the events, email chandlerk@cofc.edu, or call 843-953-5474 or 843-953-6301. About the Author: Alfred Green, a retired social worker, photojournalist and former Vice President of Book Production at Academic Press Inc. in San Diego, was born in New York City in 1938 where Count Basie’s bands served as the backdrop for the author’s transition from adolescence into adulthood. As a freelance photographer with membership in the American Society of Magazine Photographers, Green’s assignments were both domestic and international. He covered the 12th Organisation of African Unity (OAU) Conference in Kampala, Uganda. His photographs have been exhibited at The Museum of Fine Arts in Springfield, Massachusetts, Studio Museum of Harlem, Ford Foundation, Multi-Cultural Gallery in San Diego, and the Diana Galleries in New York. He received a Masters degree in Social Work from the University of Southern California and retired from the Los Angeles Unified School District as a Mental Health Consultant. He lives on the West Coast with his wife, Judy.